G-Force - Chocolate Pain's Conwy County Collision - CCW's No.1 Site for news and reviews! 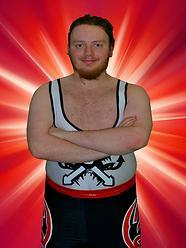 Another graduate of the highly respected Conwy County Wrestling Academy (CCWA), G-Force is a fearsome competitor. A genuine Black Belt in Karate, G-Force is simply a deadly threat in the ring and is definitely a CCW Wrestler to look out for at future events. As we'll see, he doesn't mince his words when thinking of who to put through a table! I started wrestling because I have been a fan since I have been an 11 year old and wanted to give wrestling a go. After a bit of thinking about starting I finally bit the bullet and have not looked back since. What made me want to wrestle was the admiration for the guys and girls who put their bodies on the line every night for the fans entertainment. I started training in September 2012 and made my debut in the CCW rumble during the February show this year. I remember the adrenalin rush I got from going out of the curtain to the ring during the rumbles I have done. One of my favourite wrestlers without a doubt has to be the Undertaker. I have a lot of admiration for the guy as he is so tall and yet so agile, well he was when he was younger. Also, I think ‘Taker is the best pure striker in wrestling and has adapted his character and style over the years to keep him fresh in the ring. Other favourites of mine include Ted DiBiase as I liked his ring style and I think he was one of the best wrestlers not to win a major World Championship in his career and Bret Hart as I think he is one of the best technical wrestlers of all time. Of the full timers in wrestling today my favourites are Antonio Cesaro and Kurt Angle. Favourite finishing move has to be the Tombstone Piledriver for me. That move is quite dangerous if it goes wrong but when its executed properly it looks really good. Most painful hold I have been in is the Crippler Crossface. I was put in this hold during a training match not long after I started training and I tapped out pretty quickly once I was put in it. At the moment I am recovering from an shoulder injury that I suffered a couple of months ago in training. While I have been off injured I have been helping with refereeing training matches and filming some of the wrestlers in training. When I am active in training it involves practicing some moves that I try and execute in training in matches and practicing how to fall properly when taking moves. I have a couple of favourite moments in wrestling history. My first one is the insane match between Undertaker and Mankind at King of the Ring 1998 which I think was one of the matches which defined the career of Mankind in WWF. Another one of my favourite moments has to be when Stone Cold Steve Austin defeated the Rock at Wrestlemania XV which is one of my favourite matches of all time. I would love to be involved in a triple threat match with Bret Hart and the Undertaker as I would love to have been in the ring with one of the greatest technical wrestlers of all time and one of the best pure strikers in the business. From the CCW roster I would love to face Ace Jordan and Trent Adams as I believe they would take me to the limit and put on a great match. My signature move is the Chokeslam. It is one of my favourite moves in wrestling and it is also a move that produces a lot of power and usually puts the other guy down for the three count!. Tough question. I don’t think wrestling would have been the same if the outcome of Shawn Michaels and Bret Hart match at Survivor Series 1997, which is the only one I could think of. Always believe in yourself and never let others pull you down. Just being a part of the CCW academy is my favourite part. I love wrestling so much and I believe that the support I receive from the trainers at CCW helps fuel my passion for pro wrestling. Tough question as there is a couple of wrestlers that I would like to put through a table. I think one of the wrestlers I would love to send through a table would be Trent Adams, he is a cocky guy and I think he needs taking down a peg or two. The other guy is Ace Jordan because his recent antics in CCW have been disgraceful. I am studying in college to become a legal secretary, with the hope of becoming a legal executive. Other activities outside the ring include playing other sports such as football, going for walks near where I live, taking photographs and playing video games. I used to do karate up to a couple of years ago and I achieved my black belt back in 2009. If you want to be a wrestler, you have to listen and respect the trainers when they go through moves/drills with you. Always be willing to take some praise and criticism from trainers as they have yours and your opponent’s. Also having the determination to become a wrestler is very important because you have to want to be in that ring putting on the best match you can every time you go out there. Fitness also plays a big part as you need to have fitness and strength to finish matches that you wrestle. I’d prefer Katy Perry but of the two ladies in question, has to be Rihanna. Massive thanks for G-Force for taking the time to take part in this Interview and for his excellent answers! As ever, do check out www.ConwyCountyWrestling.com for all the latest!